There are both tears and laughter at the funeral of a former ballroom dance champion, as generations of his family and friends honour the man and deal with their grief in very different ways. 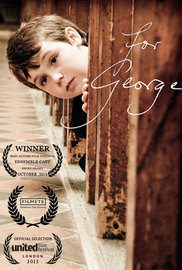 For George is a poignant and gently funny look at three generations of a family as they come together for the funeral of ballroom dancing champion, George. Seven year old Bobbie is comforted by his own explanation of the great mystery of death - that in fact Great Uncle George has been rescued from the box by Jesus and taken back to Birmingham. But the middle generation struggles to find it's way as grief and betrayal threaten to dissolve the glue that holds the family together. Bobbie and the older generation, though, know how to celebrate George's life, and with that wonderful affinity that exists between the very young and the elderly, they set about doing exactly what he would have wanted - dancing. Film PLUS mp3 download of end credits song "Dance Now!" This bundle includes the mp3 download of "Dance Now! ", the celebratory end credits theme performed by Ben Fox. This bundle includes the mp3 of "Dance Now!" (end credits) & the "For George" theme music, both written by Ben Goddard.